Rick has worked in the arts since he was able to hold a crayon. He works mainly in oil paint now, but he has experience illustrating in pen and ink, watercolor and woodcut. He is also adept at creating computer graphics using a number of programs. He is always looking to put the viewer into the scene. His work moves between landscapes and portraits, seascapes and figures. He is especially intent on capturing the subtle changes in hue and value that give paintings depth and atmosphere, denoting different times of day and year. Besides painting with his father, Richard Grosvenor, he paints with a group of plein air painters on the weekends around Newport. In addition to membership in Spring Bull Gallery in Newport, RI, he holds memberships in the Newport Art Museum, and the Providence Art Club, Providence, RI. 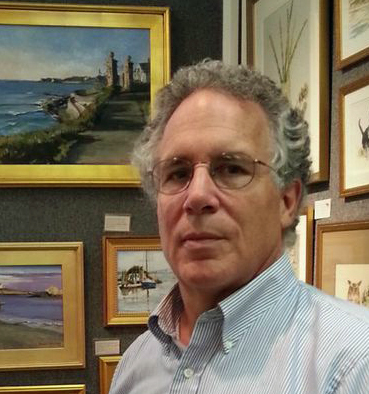 His work has been shown in a number of Newport galleries including Spring Bull, Arnold Art, and The Harbor Gallery. Additional galleries are 5 Main Gallery in Wickford, Lifeforms Gallery in Providence and Nasruden Gallery on Newbury St. in Boston. He illustrated the second and third editions of the “Beachstrollers’ Handbook from Maine to Cape Hatteras” by Donald Zinn, Pequot Press rev. ed. 1975, and Globe Pequot Press, second edition, 1985. He has been juried into the Newport Art Museum’s members’ show many times, winning the Best in Oil Painting category in 2012. He has also won a number of Honorable Mentions in other exhibitions. Rick worked at the Woods Hole Oceanographic Institute at Woods Hole, MA, where he did scientific illustration. He also taught at Brewster Academy at Wolfeboro, NH, where was the head of the Art Department. He trained under William Reimann at Harvard and under his father, Richard Grosvenor at St. George’s School in Middletown, RI.